The retaining wall at Otis House in Boston is an important artifact of the nineteenth-century development of the city’s West End neighborhood. The wall marked the dividing line between the row houses on Lynde Street and Chambers Street. Today only two of those row houses (part of the Historic New England complex of buildings that includes the Otis House) remain on Lynde Street, and Chambers Street has been replaced by the local library. The wall is showing its age after two hundred years. The southern end of the wall, in particular, became a safety hazard with a threat to collapse. In an effort to stabilize the nineteenth-centuryretaining wall the southerly end of the wall was dismantled and rebuilt. This effort included setting the four courses over the base course backapproximately eight inches so that this section is less likely to succumb to gravity. 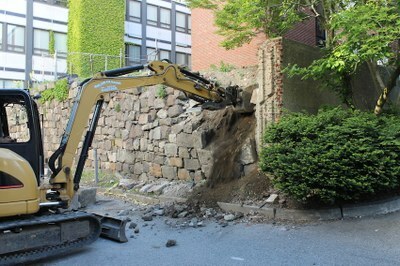 Historic New England is currently working to raise funds for the estimated $200,000 repair of the retaining wall. Support this project, and other essential preservation work at our historic properties, with a gift to the Preservation Maintenance Fund.